This October 6-7, Susan Spungen and I are holding our 2nd annual Fall Baking Workshop in the Hamptons! We will gather at Susan’s light-filled home in Amagansett during one of the most beautiful times of year to bake, harvest, share farm fresh meals, and most importantly demystify homemade pie crust so you can impress all of your friends and family this holiday season and hone those skills you’ve always longed to master. Saturday morning we will meet at Amber Waves Farm for breakfast and farm tour before heading to The Milk Pail in Watermill to pick fresh apples (weather permitting). Then we will head to Susan’s home for pie crust class where Yossy and Susan will share their favorite pie crust recipes, teach you how make pie crust by hand, and using a food processor. Everyone will work hands-on to make their own doughs. We will cover the best crusts for sweet and savory treats and how to incorporate whole grains into pastry crust. We will enjoy a seasonal lunch together at Susan’s home, then a brief photo lesson for those who are interested and a bit of afternoon free time. The group will share a cozy fall dinner complete with treats we will make together. Sunday we will start the day with breakfast at Susan’s house and a visit to Quail Hill Farm farm to pick vegetables. Susan and Yossy will demonstrate pie decorating and galette making techniques. Susan will give a Tarte Tatin demo to demystify this special dessert that relies on good and precise technique. Then we will let you loose in the kitchen to make your own galettes to take home. We will enjoy savory galettes for lunch before sending you all home with fresh pies and fresh confidence for the holiday season. Baking Lessons - We will each demonstrate our favorite pie crust techniques both by hand and using a food processor, and show you how we use them in sweet and savory treats all season long. We’ll cover the basics, like proper rolling technique, how to use a French rolling pin, how to keep your dough at the right temperature, how to pick up dough to transfer it, and so much more! We’ll show you blind baking techniques, decorative pie crusts, and traditional lattice topped pies. Then we will let you loose in the kitchen to bake your own galette to take home. You will receive one-on-one instruction from each of us. Farm Visits - Fall in the Northeast is a beautiful and abundant time in the orchards and fields. We will visit a local pick-your-own apple orchard for perfect baking apples, tour at Amber Waves, and stop by Quail Hill Farm for greens and herbs to make into savory galettes. Fresh Seasonal Meals - We will gather together around the table for breakfasts, lunches, apertivo hour, dinner, and snacks along the way all made from fresh local ingredients. Photography and Styling - While this isn’t a photography workshop specifically, we will all want to share our creations so we’ll spend a bit of time photographing our beautiful work to share on social media. All skill levels are welcome. 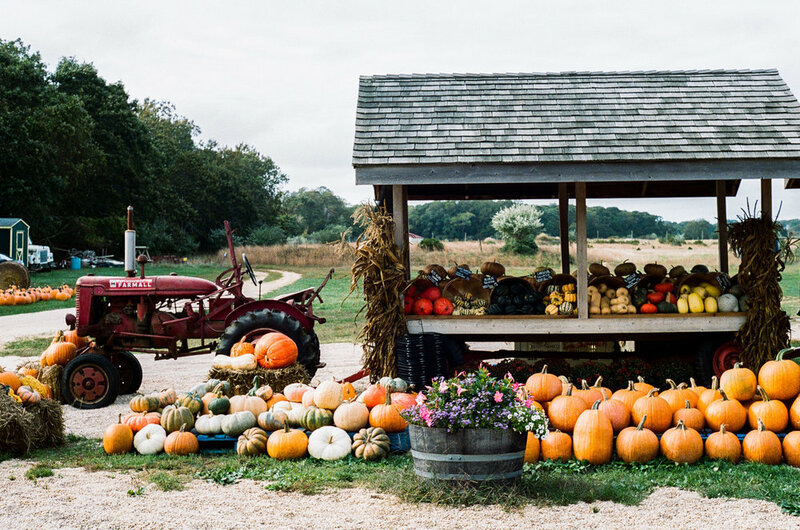 This will be a perfect opportunity to enjoy fall on Eastern Long Island and polish your skills so you feel confident in your holiday pie baking and pie-making skills. Transportation to the workshop and lodging is not included. We have identified a few local hotels and inns for the weekend. See list below. Cancellation policy: Please be sure you can attend before booking. All payments are non-refundable. We reserve the right to cancel the workshop at any time. In this case all payments will be refunded.